One of the most famous Goddess temples in Malabar, the Thirumandhamkunu Bhagavathy Temple is located at Angadipuram in Malappuram district. The temple is considered to be special by the devotees, as it is noted for the ‘Mangalya Pooja’, an offering to Goddess to get rid of all the problems related to marriage. 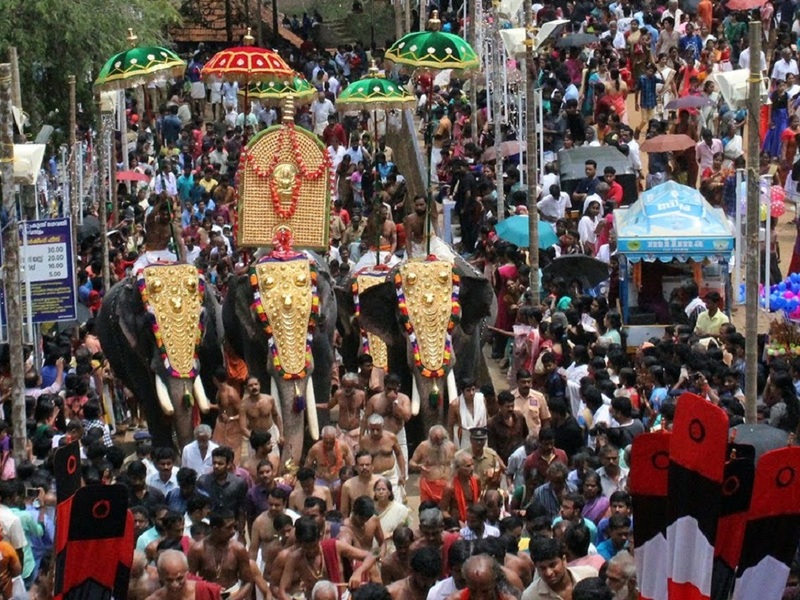 The 11-day Pooram festival is celebrated with pomp and gaiety. Starts on Makayiram asterism in the Malayalam month of Meenam (March / April), during the festival the idol of Bhagavathi will be taken out from Mathrusala (sanctum sanctorum) on a caparisoned elephant for arattu (holy bath). 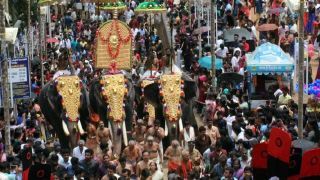 Known as Poorappurappadu, the procession will be accompanied by four elephants, nagaswaram and chendamelam and will continue for the next 10 days. 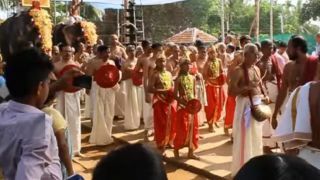 The main attraction of the festival is these processions from temple to the river and back, which will be done in two times - one in the morning and the other in the evening. Altogether the festival witness 21 arattu of the Goddess. 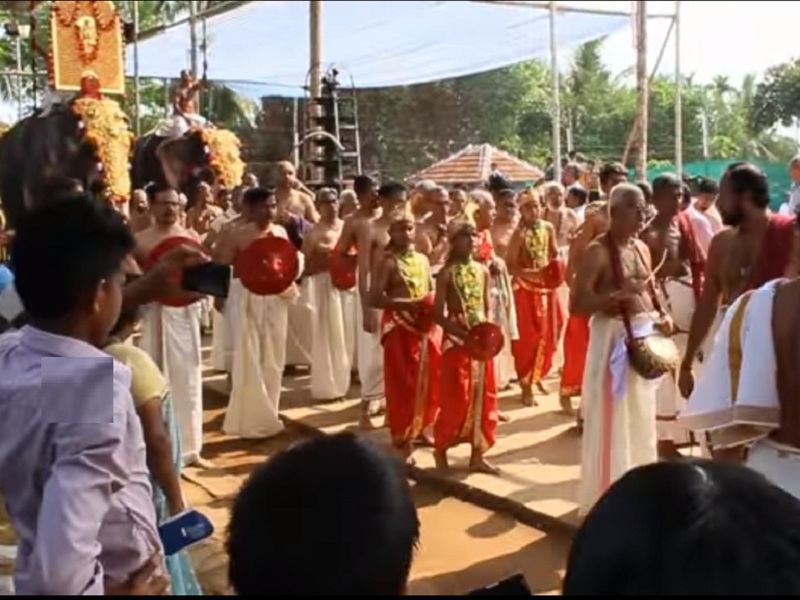 A large number of devotees, heroes representing the traditional squads and the Komarams (oracles) of Aalikkal, Vayilamkunnu and Kongadu Devi temples take part in the procession. 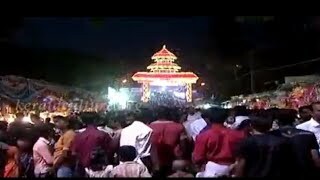 Another interesting ritual held on the Pooram day midnight is the ceremonial meeting between Valluvakkonathiri, the king of the erstwhile kingdom of Valluvanadu and Malayankutty, the head of Pana tribal community. Known as Panante Varavu, this commemorates the religious harmony existed in the bygone days of Malabar. Poothan, a folk art form popular in Malabar region is performed during the festival days at temple premise. The festival was made annual event by Mankada Valluvakonathiri. It is said that the history of pooram festivals dates back to the early decades of the 16th century as it is written in the palm leaf records of Calicut University. Kalampattu, with the Kalam of goddess sitting in Pattukottil, will be celebrated every year from 1 - 10 of the Malayalam month of Vrischikam (Mid November). The age-old custom of Attangayeru held on first of the Malayalam month of Thulam and on the new moon day of the same month in the forenoon before pantheerady pooja. It refers to the legendary fight between Mandhata of Surya dynasty and of Bhadrakali. Devotees stand an top and bottom of the northern entrance and throw each other the fruit abundant with the conical seeds.